When De Caro brothers, Julio and Francisco, formed their sexteto in 1924, and Julio proclamed “El tango también es música”, they very quickly rose to fame. Complex arrangements and harmonies, virtuoso violin of Julio, breathtaking bandoneon duo of Pedro Maffia and Pedro Laurenz (see “Tango stories: Amurado”), and firm hands of Francisco – both on the piano and on the management, just in a few months brought their sexteto into the rank of the most desired tango orquestas in Buenos Aires. In April 1927 brothers were approached by Brazilian impresario Juan Carlos Pinto with an offer to play in Rio de Janeiro. Because of the contractual obligations in Buenos Aires, Julio “politely declined” the offer, by asking an incredible amount of 2000 pesos for a single night. To everyone’s surprise, the very next morning they received the confirmation and the tickets to Rio. The following presentation was so successful that two weeks of the contract turned into many months. 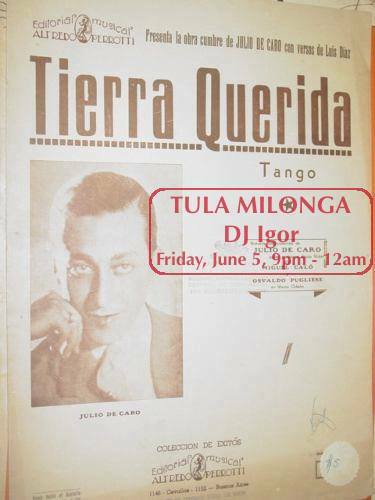 One gloomy and sleepless night in August, tired and homesick, Julio De Caro recorded a few lines of music on a piece of paper… only to wake up to the roaring sounds of Pedro Laurenz bandoneon, playing his new tango, full of sadness and tender love to their homeland – “Tierra querida”.